We had my daughter baptized for family reasons. My price was that I got to choose the cake. For some strange reason my parents had me Christened ( starting out with such a handicap I have done well) anyway my cake had a Stork on it. What does this mean? I love the original posters FSM cake, at least his child will not grow up confused thinking it has to buy a Stork flowers on mothers day. Gamekeeper, Christianity used to control access to all social facilities, including welfare, relationships and entertainment. It was done to avoid being an outcast. Obviously, you were delivered by a stork and left in the cabbage patch. I suggest a bunch of cabbage flowers on Mother’s Day. 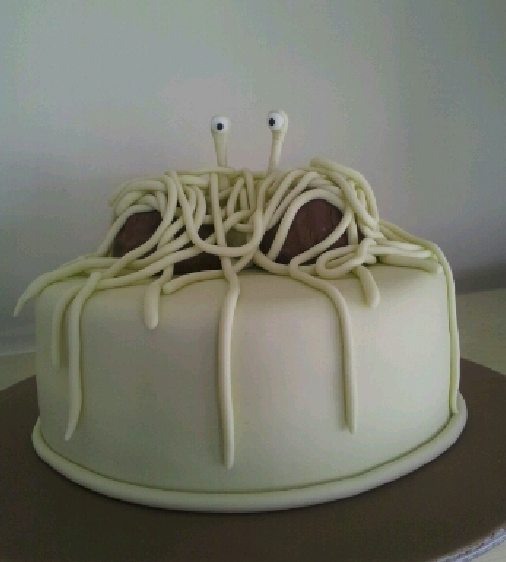 I get the FSM on the top, but was the rest of the cake supposed to look like a huge condom or was that just an accident? On a side note, I was baptized in one Lutheran church, attended a different Lutheran church (with glazed Navajo sand-paintings of Navajo gods around the altar and a pastor that was happy to discuss how many Christian concepts were taken from older religions, like the cult of Mithras). I’m sure I’d still be what I am today (Atheist) without my religious upbringing, but it was nice to have that rather pleasant and fun-loving buffer along the way. To the youth groups of that lovely church: feel free to carry on our tradition of getting kicked out of religious retreats for not being as prudish as the Missouri synod – it’s all about the Rocky Mountains. Dear Her High, WELCOME! Please visit us as often as possible. Other people can continue worshipping their false gods, it doesn’t bother us. But PLEASE don’t be an atheist – accept our noodly Lord! so cute your make that cake very funny..